SACRAMENTO – Once again, tests showed that the vast majority of fresh produce collected by the California Department of Pesticide Regulation (DPR) met national pesticide residue standards. During its 2017 survey, DPR found 96 percent of all samples had no detectable pesticide residues or were below levels allowed by the U.S. EPA. The findings are included in DPR’s just released 2017 Pesticide Residues in Fresh Produce report. The 2017 report is based on year-round collection of 3695 samples of produce, from 28 different countries, including those labeled as “organic.” DPR scientists sampled produce from various grocery stores, farmers’ markets, food distribution centers, and other outlets throughout California. The produce is tested for more than 400 types of pesticides using state of the art equipment operated by the California Department of Food and Agriculture. The U.S. Environmental Protection Agency (U.S. EPA) sets levels for the maximum amounts of pesticide residue that can be present on fruits and vegetables, called a “tolerance.” It is a violation if any residue exceeds the tolerance for the specific fruit or vegetable, or if a pesticide is detected for which no tolerance has been established. 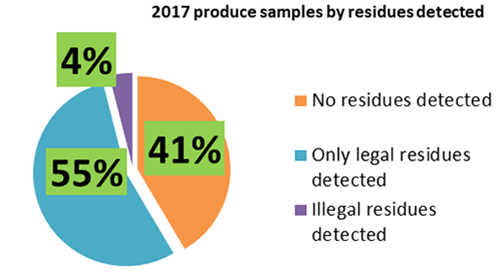 Percentages of produce samples collected in 2017 with legal, illegal, or no detected pesticide residues.